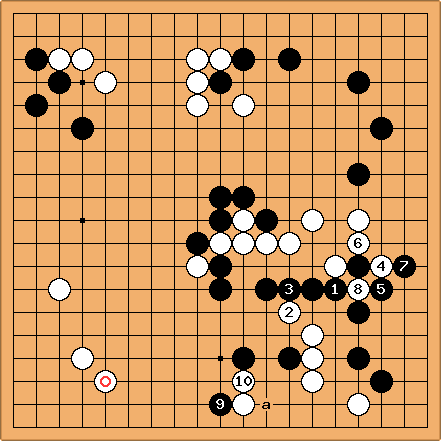 This example comes from the famous game in which Hans Pietsch, then 1p, defeated Yoda Norimoto, 9p, then one of the world's top players, by half a point in the 2nd LG Cup (round 1, 1997-06-27) . The game is commented here (broken, take this) by An Younggil of gogameguru, as a tribute. The ko displays the ideas of enlarge the ko and yield the ko. Black has taken the advantage early in the game. 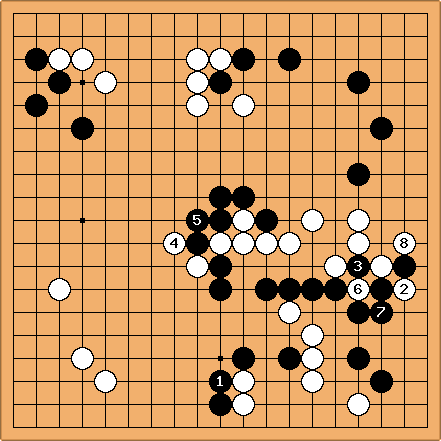 White took a big point so that Black had to launch an attack on the white center right. White tries to make sabaki and after , White starts a ko with . The first threat is , which could kill the bottom with a move at a. responds. Next it would be natural to take back the ko. tries to fix the bottom before returning to the ko, but this allows White to surprisingly enlarge the ko at . takes the ko and White plays the only local ko threat in this ko. Black is left without ko threats and must yield in this ko. makes life and in effect White has come out of this ko as the winner without giving anything in return (the usual ko exchange). Suppose Black does play a ko threat, for example here. captures through to win the ko, then when Black executes his threat with , a move like (or a or b - this diagram is not pro analysis) will destroy the complete lower right, while Black's compensation at the top is not very solid. By winning the ko without compensation, White restored the balance in the game. 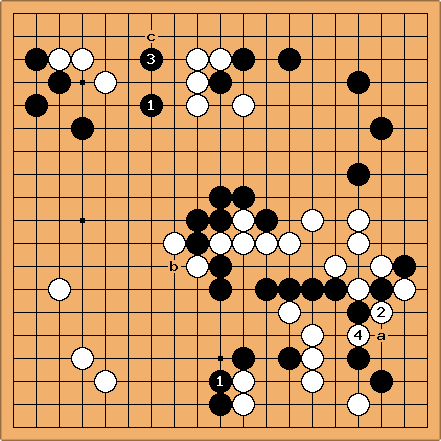 The maneuver allowing him to win the ko was enlarging it so that Black had to yield as to minimize his loss.